Dr. Samira Gumma-Swiatkowski, Graduate, Ph.D. in Education: My biggest thing was the library, accessing the library, so if I can’t find something, or there was an article I needed, they could get it for me. They could tell me where to get it. And they would tell me, “Okay, give me 24 hours and I will try to find where I can locate that article for you,” and sure enough, it was right there. If I had an issue with technical support, they were right there to help me out, walk me through it. And the hours didn’t really matter; it was almost like 24/7 they were online. So, no matter where you’re from—the “Live Chat” I love—you can go on live chat and get your questions answered, and if they didn’t have the answer for you, they would give you names and email addresses or phone numbers so you can call that person or that department. So, it’s available at your fingertips from the time you wake up until the time you go to sleep, or even in different countries or different time zones. Preye Buowari, Graduate, M.S. 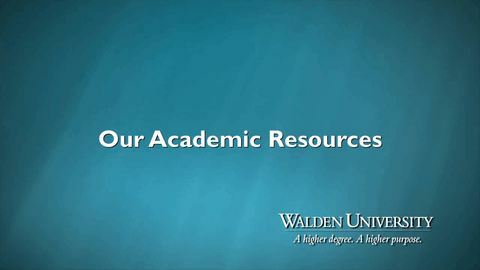 in Project Management, Student, Ph.D. in Business Administration: Walden was one of the best universities that answered all the questions I had about the ease with which I would use to complete my studies. And the fact that there are so many resources to make it easier for me to navigate the classroom, submit assignments, technology support. There’s so much resources available that makes it easy for you to navigate through the classroom or through your assignments.